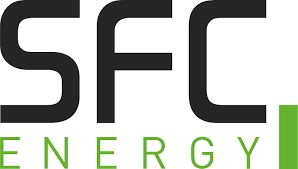 Brunnthal/Munich, August 21, 2018 – SFC Energy AG (F3C:DE, ISIN DE0007568578), a leading international supplier of stationary and mobile hybrid power supply systems based on fuel cells, published its results for the first half of 2018 today. SFC Energy AG is looking back on the best half of a financial year in its history. In the period from January to June 2018, the Group generated sales of EUR 30.86 million as compared to EUR 26.31 million in the previous year. This corresponds to an increase of 17.3%, which is primarily attributable to increased growth momentum in the Defense & Security segment, as well as in the Oil & Gas and Industry segments. In the period under review, the Oil & Gas segment benefited from the continuing relative stability of the oil price and consequently from growing momentum in maintenance investments and in new project business. Sales rose from EUR 11.69 million in the first half of the previous year to EUR 12.17 million in the first half of 2018. On a Canadian dollar basis, sales were increased by more than 11% year-on-year. The Industry segment displayed impressively robust growth again in the reporting period. Sales climbed by 9% from EUR 7.63 million in the previous year to EUR 8.31 million in the first half of 2018. This growth was primarily due to the positive development of the subsidiary PBF Group, which posted growth with existing customers and very pleasing new customer business, particularly with the new product platform. The Defense & Security segment made the greatest contribution to growth in the period under review. Sales increased significantly from EUR 1.42 million in the previous year to EUR 5.65 million in the first half of 2018. This substantial growth was attributable to the defense order from the German armed forces (Bundeswehr) for portable power supply in the amount of EUR 3.6 million and the follow-up order for ruggedized fuel cells from an Asian defense customer. Sales in the Clean Energy & Mobility segment were down by EUR 840k year-on-year in the first half-year of 2018. It should be noted that in the previous year a major order for surveillance systems for Singapore had been recognized in sales. In the second quarter of 2018, sales were already up slightly again at EUR 2.38 million as against the same quarter of 2017 (EUR 2.36 million). Sales in the Clean Energy & Mobility segment thus totaled EUR 4.73 million in the first half of the year, down roughly 15% on the previous year’s figure of EUR 5.57 million. In the period under review, SFC Energy successfully entered into a partnership agreement with Beijing Green Century Technologies. This company is an established market leader for value-added EMC, electricity, and other electronic component solutions for wind and solar power and for e-mobility, the rail sector, and telecommunications. Beijing Green Century Technologies’ wide-reaching distribution network and good connections within the sector will sustainably support the SFC Energy Group’s international expansion strategy. For 2018 as a whole, SFC anticipates growth in this segment, too. Gross profit posted a significant increase to EUR 10.57 million in the first half of 2018 (previous year: EUR 7.94 million). The gross margin was increased from 30.2% to 34.3% of sales. The margin increase is a key element in improving the earnings figures. Consolidated EBITDA improved significantly from minus EUR 546k in the previous year to plus EUR 1.06 million in the reporting period. Adjusted for non-recurring effects, EBITDA posted a substantial increase to plus EUR 2.13 million (previous year: minus EUR 369k). The Group’s EBIT improved to plus EUR 497 k in the first half of 2018 (previous year: minus EUR 1.52 million). Not including non-recurring effects, underlying EBIT came to a positive amount of EUR 1.57 million (previous year: minus EUR 988k). The consolidated net result improved to minus EUR 149k in the period under review after minus EUR 1.82 million in the previous year, and earnings per share in accordance with IFRS (basic and diluted) therefore came to minus EUR 0.02 (previous year: minus EUR 0.20). Available cash and cash equivalents increased to EUR 7.30 million as of June 30, 2018 (December 31, 2017: EUR 4.41 million). This was chiefly due to the positive cash flow from operating activities and an inflow of cash from financing activities. The issue proceeds from the capital increase provided the company with cash in the amount of EUR 4.22 million. The equity ratio increased from 40.2% as of December 31, 2017, to 46.5% at the end of the first half of 2018. As of June 30, 2018, SFC Energy had 265 permanent employees (December 31, 2017: 258). For the current financial year, the Management Board of SFC Energy AG is optimistic that the company will be able to achieve the announced sales goal of between EUR 60 million and EUR 64 million along with a further significant improvement in underlying EBIT and EBITDA. “Our half-year figures sustainably confirm the growth track that we are moving along. We are observing a robust general increase in demand for clean, efficient and reliable energy supply solutions based on our fuel cell technology. Particularly in the Defense & Security and Oil & Gas business segments, we anticipate increased investments by market participants over the remainder of the year – partly due to the traditional year-end business. The growing demand for clean mobility solutions and the increasing spread of e-mobility will also bring considerable growth opportunities in the medium term. As the world’s first fuel cell company to operate profitably, we are therefore optimistic for 2018 as a whole and for the future of SFC Energy AG,” says Dr. Peter Podesser, CEO of SFC Energy AG. With regard to the outlook, it should be noted that an average CAD/EUR exchange rate of 1.50 was used for the sales and earnings planning for 2018.